Looking for ways to make your Christmas Christ-centered? While our culture launches the Christmas season with the consumer-frenzy that is Black Friday and then packs the next weeks leading up to Christmas with all things Santa, reindeer, and elves, we can incorporate traditions in our family that help us focus on Jesus. I’ve found I have to be intentional about our time and activities during December to keep Jesus the center of the season. That’s why I love Advent traditions. Advent keeps the weeks leading up to Christmas Day focused on the real Christmas story – that God himself took on the flesh of an infant and dwelt among men to pay for our sin and secure our salvation. Why would we ever want to make Christmas about anything else? Advent is a perfect time to celebrate anticipation and teach truth. Advent is a time of anticipation and preparation for celebrating the birth of Jesus. It’s a time of reflection, remembering and worship. Advent stems from the Latin word that means “coming.” It’s two-fold: in Advent we look back on the first coming of Jesus as a baby and look forward to his second appearance that still awaits. Many churches that follow the liturgical calendar observe Advent on the four Sundays leading up to Christmas Day. But Advent is a season and can be observed in ways that fit each family. Making and keeping our own family Advent traditions helps us push pause on the busyness of December and carve out quiet moments to focus on Jesus’ birth. Advent is a perfect time for families to teach gospel truths and allow children to ask questions. 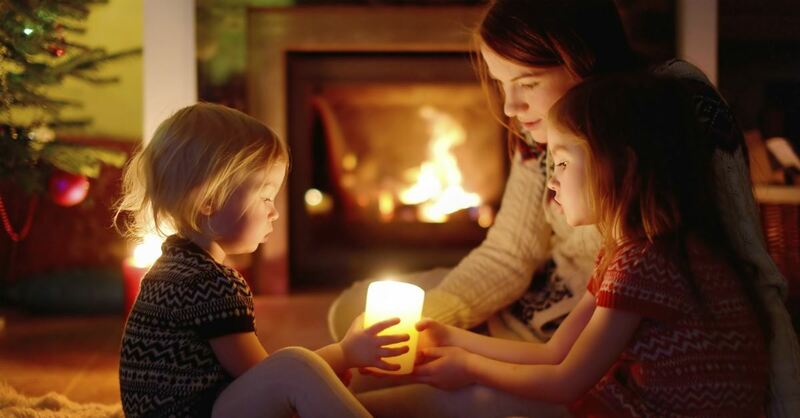 Here are 15 Advent practices your family can adopt this season. 1. Prepare an Advent wreath. The traditional advent wreath uses four purple candles spaced evenly around a green wreath with a white candle in the center. Beginning the fourth Sunday before Christmas, light one purple candle, adding one candle each successive Sunday. On December 25, the Christmas candle is lit. The advent wreath can be combined with readings of scripture and prayer to help prepare hearts for Christmas. Create these simple but unique scripture wrapped candles to use for your family’s Advent. Print out four verses about the birth of Christ, cut them out and wrap them around candles, applying them with a glue and water mix. Build your Nativity one piece each day along with corresponding scripture and readings from Countdown to Christmas: Unwrap the Christmas Story with Your Family in 15 Days. It’s a slow way to savor the real Christmas story and let children build anticipation as they build their manger scene. With 15 devotions, our family can easily do this even with nights out for other Christmas activities. 4. Create an Advent Calendar. I grew up with cardboard advent calendars containing 25 tiny windows that each held a tiny wrapped chocolate. These are still around but your family can also create your own using a chalkboard, a banner or even take-out boxes. This post shows how to string and decorate 25 mini takeout boxes, fill them with tiny treats and then hang on the mantle or in your kitchen. It’s easy to gloss over the familiar scriptures that tell of Jesus’ birth we may have heard year after year. Familiarity can make us miss their deep significance. Writing scripture forces us to slow down and meditate on the words, the phrases, the meaning of what we’re writing. We can pray through the scripture or find application as we’re writing. Use this list of Christmas Bible verses to write out one or two verses each day in your favorite journal. Christingle means “Christ light.” It’s a tradition started in Moravian churches but now used more widely across Europe. Christingles are made by tying a red ribbon around an orange and then placing candies and a single white candle into the orange. Spend evenings sharing a great story about the real meaning of Christmas. Elementary and middle-aged children will enjoy one of the storybooks for Advent. The series starts with Jotham’s Journey, where 10-year-old Jotham meets innkeepers, shepherds and wise men leading him to Bethlehem and baby Jesus. This book, and four others in the series, are divided into short chapters for each day of Advent. 8. Use the Jesus Storybook Bible. This beloved Bible retells the Biblical narrative centered on Jesus and told in short chapters for young children. Cuddle up and read one short story each night for 24 nights to recount the prophesies and details of Jesus’ birth. You can find the Bible stories and reading schedule here. 9. Make a book tree. This is both an Advent activity and Christmas decoration! Separately wrap a dozen or more Christ-centered Christmas picture books. You can use simple brown wrapping and string. Stack the books from largest on the bottom to smallest on top with corners turned at different angles to create a Christmas tree look. Then watch as your children wait with excitement to open and read the next book! Most stores and radio stations are playing the likes of “Santa Baby” and “Grandma Got Run Over by a Reindeer.” But we can create and stream our own playlists to help us prepare our hearts and worship the King. You can put together your own free playlist in Spotify here or listen to this playlist of 15 Christ-centered Christian songs and carols. 11. Make a Blessing Jar. Advent reminds us that Jesus left the riches of heaven to become a servant for our sakes. (2 Corinthians 8:9) The blessing jar is a reminder of Jesus’ service, sacrifice, and gift of salvation. Brainstorm with your family ways you can serve others through the Christmas season. It might be leaving a cooler of sodas by the front door for mail carriers, donating unused coats, making a meal for a new mom or elderly neighbor or volunteering for a local Christmas charity. Each time you serve or give, write about it on a slip of paper, roll the paper up and place it in the Blessing Jar. The jar will be a visual reminder that Jesus became a servant for our sakes and calls us to serve others. 12. Create a living Nativity. Our friends stage a living Nativity on their front lawn one night each Christmas with their family. You may need to enlist neighbors or friends to help but costumes can be as simple as old sheets for robes and dish towels for headdresses. Use a large box or small crate for the manger. Even the family dog can be dressed up as sheep or cow. You can either create a still life, much like a manger scene, or have someone narrate the Christmas story from Luke 2. Another beloved Advent tradition is making a Jesse tree. The Jesse tree uses ornaments hung on a special tree or a large branch to tell the story of redemption God promised through Jesus. Also called a Tree of Jesse, simple ornaments symbolizing each story are made and hung on the tree. The ornaments generally start with a globe -- representing creation; an apple -- representing the fall; a rainbow – representing God’s covenant with Noah, and so on all the way through an ornament of stone tablets – representing the 10 commandments; a sheep for the shepherds; and a baby in a manger for the birth of Jesus. You can read more about the Jesse tree here. 14. Act out the Christmas story. I’ve often heard of children acting out the Christmas story on Christmas day. But what if it could be acted out over a series of days? Start with the annunciation to Mary in Luke 1:30-31 one day followed by the annunciation to Joseph in Matthew 1:18-21 on another. Then take a few days to tell the story as it unfolds in Luke 2 – first the trip to Bethlehem and finding no room in an inn; then the birth; the announcement to the shepherds. Finally, let your children act out the pilgrimage of the magi to see the Savior recorded in Matthew 2:1-11. Taking one act each night will help your children understand the fullness of all God was doing in the birth of Jesus. 15. Pray the names of Jesus. Jesus is given more than 50 names in scripture and each one helps us understand his nature and character. Choose one name each day, praise Christ for who he is and then pray the name of Jesus. For example, the first name of Jesus on this list is Almighty One. Praise Jesus for his power greater than anything in all creation, thank him for fighting your battles and then ask Jesus to help you trust him no matter how hard your circumstance appears. Lisa Appelo is a writer, speaker, and Bible teacher encouraging women to deepen their faith and find hope in the hard. She’s a widow and single mom to 7, after her husband’s sudden death. You can connect with Lisa at LisaAppelo.com and find her family Advent book: Countdown to Christmas: Unwrap the Christmas Story with Your Family in 15 Days on Amazon.